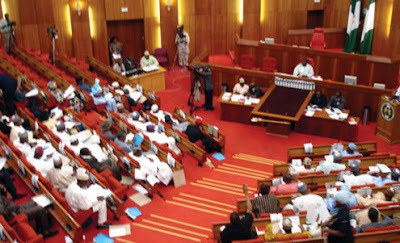 Some Nigerian senators said Wednesday they are suspicious the Nigerian presidency is behind the sudden disappearance of the 2016 budget submitted to the National Assembly. The lawmakers said the intelligence they had so far gathered suggested that the presidency discreetly withdrew the documents to enable it to make some adjustments to it. The president had presented the budget to a joint session of the legislature in December. PREMIUM TIMES had reported Tuesday that the senate, during an executive session, declared the documents missing. The Senate Leader, Mohammed Ndume, sources said, informed the senators, upon resumption from the Christmas/New Year break, that deliberations on the budget could not commence until fresh copies of the documents were obtained from the presidency, Ministry of Finance or its national planning counterpart. However, some senators, who requested not to be named so as not to anger the presidency, told PREMIUM TIMES they had since realised the budget was discreetly withdrawn by the president in order to make some adjustments. The senators said the presidency had in the past two weeks been combing through the budgets with a view to removing provisions that had so far exposed the administration to ridicule. “The executive have now started delivering fresh copies of the budget documents to the National Assembly,” one of the senators said. But the presidency has however denied withdrawing the document. The Senior Special Assistant to the President on Media and Publicity, Garba Shehu, said only Mr. Buhari could withdraw the budget but had not done so. He suggested that the issue of missing budgets should not arise because several copies of the document were sent to the legislature. “Nobody except the president can withdraw the budget; as far as we know, he hasn’t done that,” Mr. Shehu said in a response to PREMIUM TIMES enquiry on the matter Tuesday. “The copies in their hundreds have been delivered to both chambers of the National Assembly. When contacted, the Minister of State for National Planning, Zainab Ahmed, expressed shock at reports of missing budget. She explained that ahead of Tuesday’s resumption of the Senate and House of Representatives, more than 400 copies of the document were delivered to the two chambers on Monday by the printer, for distribution to all members. “After the official presentation of the budget by the President on December 22, 2015, both hard and soft copies were given to some key members of the Assembly. How can anyone say all the copies are missing?” she said in an interview with PREMIUM TIMES. “Immediately after the presentation (by Buhari), most of the members went on break. But a printer was given the job to produce the document for distribution to all members on resumption. Mrs. Ahmed argued that if there is need to withdraw the budget, the same process with which it was presented by the president to the legislature would be followed.